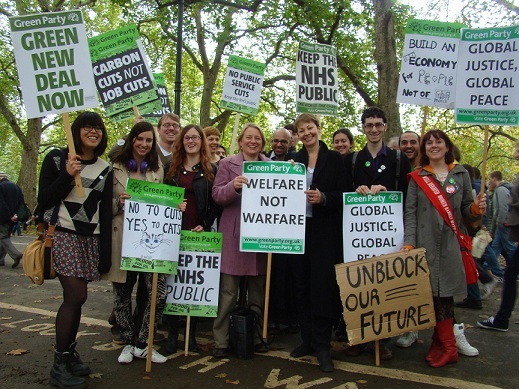 Natalie Bennett and Caroline Lucas MP with Young Greens at the TUC ‘A Future That Works’ march in London. For left-leaning political observers, the widely-trailed resignation of Andrew Mitchell as Conservative Chief Whip last Friday over ‘Pleb-gate’ has had a certain piquant appeal. Worryingly though, many of those celebrating his departure to the back benches don’t really seem to care whether he did actually use the elitist, boorish language that he had been accused of, because the narrative it paints fitted so neatly with their own prejudices around the Tories. We’ll never truly know whose account was the honest one, but on a personal note, it leaves me with an uneasy feeling that political advantage has potentially come before natural justice. What makes this story is resonant is that it really underscores a seam of unease amongst the public about the Conservative commitment to the poorest in society. Back in April, I warned that we need to be careful in how forcefully we tug at this thread, as similarly sweeping impressions of Green’s class privilege exist in the mind of the public. Whilst triumphalism at Mitchell’s downfall has also been present amongst Green activists, I’m much more impressed with constructive developments within the party in how we negotiate class politics since I wrote about it earlier this year. As the dust settles on our party conference, it is clear that where our recent leadership contest has been successful is in filtering a greater sense of our commitment to poverty, inequality and public services to (at the very least) left-leaning voters. It didn’t hurt that to at least some degree, all four of the main candidates put these issues at the heart of their pitch, as a consequence, quietly and definitively shifting the centre of gravity within the party too. It is telling that the media traction that Natalie Bennett received in the aftermath of the Leadership ballot focussed around issues such as housing policy, rather than the usual environment issues. Whilst we must factor in that the media currently has little interest in covering issues outside the economy, it is to our credit that we are developing the outlines of a narrative distinct from those of other main political parties that can survive sustained media scrutiny. In more visceral ways too, we are making a step change in our approach. The TUC anti-austerity march this weekend, which was attended by at least 100,000 demonstrators, was heavily attended by Green parties, members and our party leader. Over the weekend, I was pleased to see my Facebook and Twitter feeds littered with picture after picture of Green activists on the march, placards held high. A presence like this matters, because it changes perceptions amongst others demonstrating that we put our collective money where our mouth is in fighting alongside them for equality. In our stronger constituencies, like Brighton & Hove, we are also hearing of a deepening relationships between local unions and elected Green officials on a number of bread and butter employment issues. Much more frequently, I’m hearing from others about how productive and effective these relationships are being in mobilising support for common policies. Longer-term, we could be looking at potential financial support from those unions disappointed with Labour’s record in supporting working people. These are necessary first steps forward in an evolution in Green political strategy, one in which I detect the hand of a fresh generation of younger Green activists pushing hard against a tendency amongst many of the older guard towards complacent, intellectually sound inaction. More than ever, we need to accelerate our preparedness as an organisation to run with the grassroots energy of these New Wave Greens who are increasingly reflecting the priorities of mainstream Britain.